Northeast corner of Bannister & Blue Ridge, across from Walgreens. The transit center’s features include real-time bus arrival signs and Smart City kiosks, bike racks, shelters, 26 park-and-ride spaces, lighting, and accessible ramps for riders with disabilities. 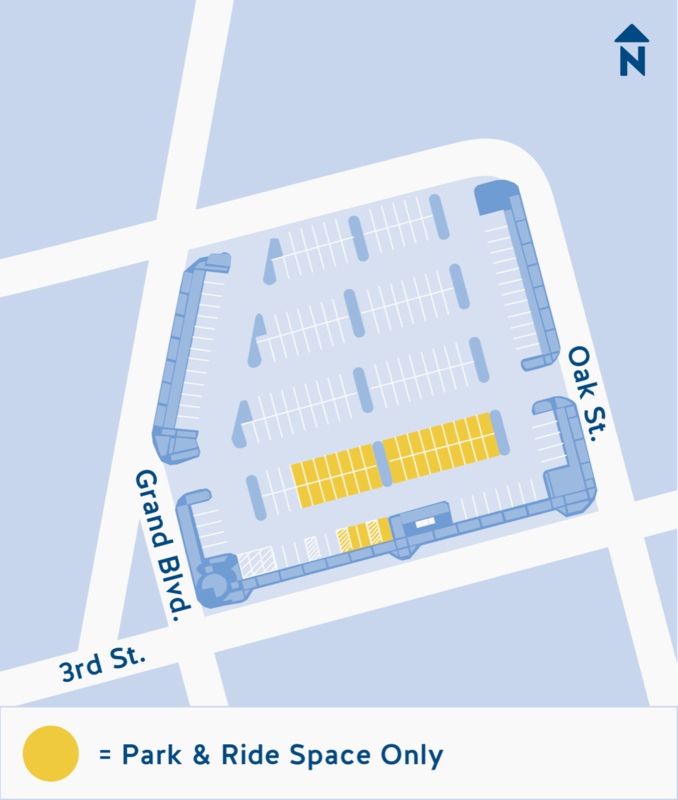 The City of Kansas City, Missouri, and City Market charges for parking at 3rd & Grand, consistent with the overall parking policy in the River Market area. Parking fees at this lot is $1 per hour, Monday through Friday, 7 a.m. to 6 p.m. About thirty spaces will be reserved for transit riders. Each spot will have a sign that indicates it is for transit riders. Near I-29 & Barry Road. Park in designated spots on the north side of the transit center. Park at the JCCC Garage East near Carlsen Center. Park in the lot east of 47th St. at the transit center. Parking next to Wendy’s on the south side of Martway, just east of the transit center. Park at the shelter south of Hillcrest Bank, northeast of Macy's, along Nieman.